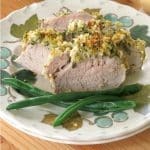 Herb Roasted Pork Tenderloin is slathered with a lemony mustard sauce and pressed with a Parmesan cheese and fresh herb breading. It’s a delightful presentation that’s delicious too! This irresistible topping was used to make Herb Crusted Chicken! It will work with any type of pork and even fish. Customers came in droves to our make ahead meal assembly kitchen to make it, often with a special occasion in mind! Holiday dinners were always on my mind. We filled the monthly menu at our meal assembly kitchen with dinner options that would be perfect for Christmas Eve, New Year’s, Mother’s Day and every type of meal in between. Make this recipe and you will definitely have a winner! It’s undeniably pretty…but, not difficult to prepare. It’s a lower-calorie, lower-carb dinner option…but, it doesn’t taste like it. It can be made ahead of time and frozen. Yep! The crust is a mixture of breadcrumbs, Parmesan cheese, fresh basil and parsley. Olive oil and a touch of the lemon mustard sauce slightly moisten the topping that is pressed over the pork tenderloin. There’s a video just before the recipe with more pictures! Make the breading in advance and finish the recipe just before baking. Make the entire recipe and refrigerate until ready to cook. Or, make the recipe and freeze until ready to cook. Note: Use a gluten-free breadcrumb substitution if necessary. I’m not sure that there is an herb that won’t work in this recipe. If you have a favorite combination, try it and let us know! Or, check out this Herb Guide with meat pairings for more ideas! Inevitably, when someone sees a slice of pork tenderloin that is slightly pinkish and a little juicy in the center they will ask “Is it done?” Most likely, yes! That’s exactly what the final dish should look like when it’s done. Dry, overcooked pork is not tasty. The key is to just cook pork tenderloin to the proper internal temperature of 145 degrees F using a meat thermometer. Allow it to rest for about 3 minutes after taking it out. Pork is not poultry. It’s a type of red meat. You want a juicy center! Make the recipe, but don’t cook it. Place the prepared pork in a baking dish that is freezer safe and cover it with aluminum foil and plastic wrap. This dish should stay fresh for up to two months in the freezer. Be sure to label it! When you are ready to enjoy this recipe, defrost it in the refrigerator overnight and then cook it according to the instructions. Oven Roasted Potatoes using some of same fresh herbs! Tip: Roast vegetables at the same time as the pork tenderloin! Finish the evening with a decadent dessert, such as flourless chocolate cake with ganache. I’m just sayin’ it’s a dinner your guests will remember! Pork Tenderloin is slathered with a lemon mustard sauce and pressed with a Parmesan cheese and fresh herb breading. It's as tasty as it is pretty! 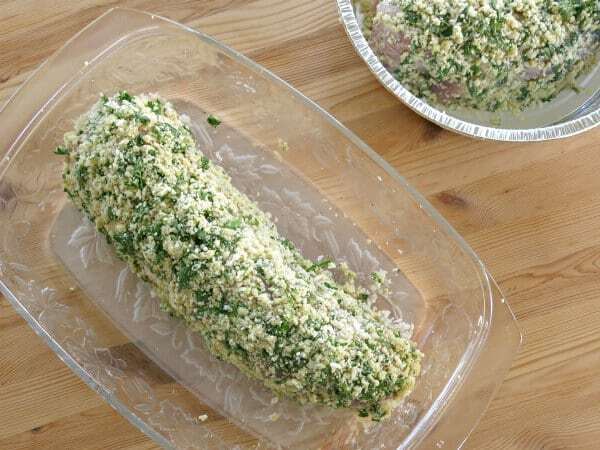 Separate the pork tenderloin into two pieces and place in a baking dish. Mix lemon juice, Dijon mustard and pepper together in a small bowl and set aside. 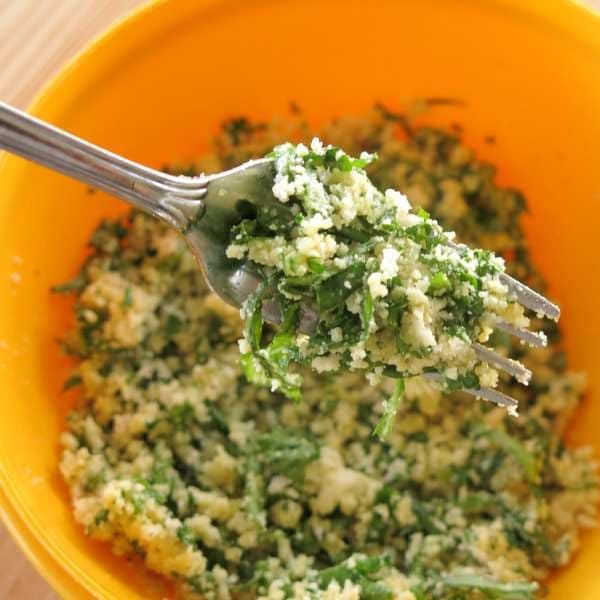 Combine breadcrumbs, Parmesan cheese, olive oil, parsley, basil and 2 Tablespoons of the mustard mixture in a separate bowl. Using a fork, combine the ingredients to form a crumbly mixture (see picture in post) together in a separate bowl. Roast uncovered for about 35 minutes or until the internal temperature reaches 145 degrees F in the thickest part of the meat. Allow pork to rest for about 3-5 minutes after cooking and then slice. To make ahead and freeze, prepare through Step 6. Do not cook. Place in a hard-sided, freezer-friendly container, preferably one that can be placed in the oven when ready to cook. Store for up to two months in the freezer. When ready to enjoy, defrost in the refrigerator for 24-36 hours then cook according to directions. I was just thinking I need to make a pork loin. And the flavors here?! So delicious!! Love pork tenderloin and I’m always looking for new ways to prepare it. Love this! It would definitely be a dinner to remember. This looks so good! 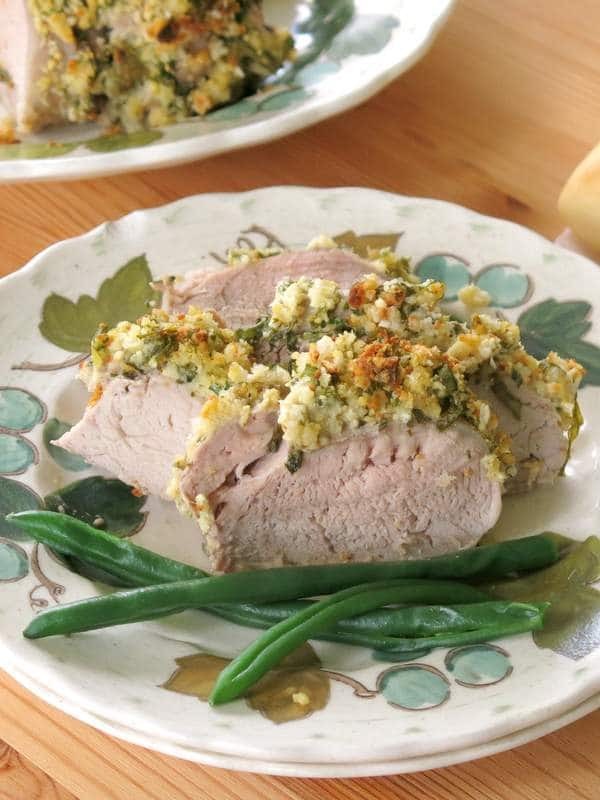 This recipe looks so delicious, the herbs in the crust pair so well with pork tenderloin! Lemony mustard sauce? I am ALL IN! pork tenderloin is one of our favorites. This herb crust looks gorgeous and sounds so good! This is fabulous. 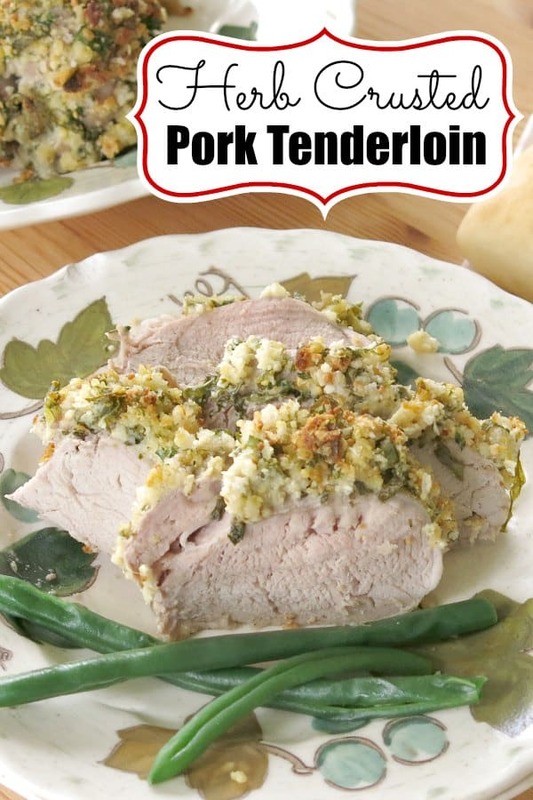 I love pork tenderloin, this is a great way to prepare it. I am always looking for new ways to prepare pork tenderloin. I could probably eat that herb crust with a spoon. Sounds fantastic! That herb crust is fantastic! What a gorgeous pork tenderloin, Marjory!! I love crusting pork with mustard and herbs. Your crust looks great! Mmm! This looks like the quintessential winter meal, the perfect comfort food! Can’t wait to try it! This is a gorgeous meal. Perfect for entertaining. Thanks for the recipe! Thank you so much for this! I have two Pork Tenderloins in the fridge to use up! I’ll have to make this either monday or tuesday! With basel and rosemary substituted for the bay. Delicious. Always looking for great new ways to make pork, this one is a winner. So delicious! Love good pork recipes.